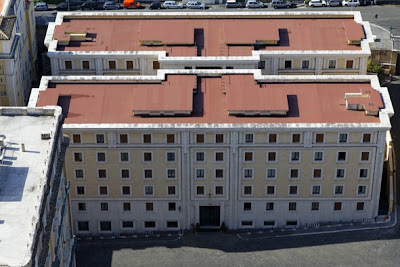 Not that it's terribly a surprise, but now it's official – Pope Francis has chosen not to live in the Papal Apartment of the Apostolic Palace, opting instead to remain in the simpler, more communitarian atmosphere of the Domus Sanctae Marthae, the Vatican "hotel." 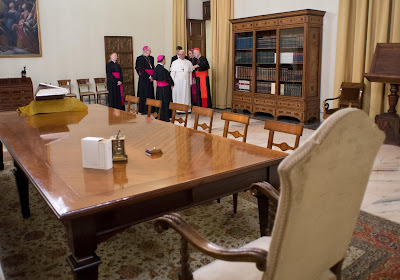 Less than two weeks since the pontiff's election, the latest move in Papa Bergoglio's Vatican "revolution" was announced by the Holy See's lead spokesman, Jesuit Fr Federico Lombardi, confirming a report in today's La Nación, the Argentine daily of record. Francis himself spoke of the decision at today's morning Mass in the Domus chapel – which, continuing his now-daily custom, was celebrated with guests: in today's case, the permanent community in residence at the Domus. Having reportedly remarked that the official living quarters "can fit 300 people" on his first tour of it (above), the Pope will continue to use the suite on the Palace's top floor as an office where he'll receive official visitors and handle other daytime work. Lombardi said today that Francis has now moved to a suite in the Domus, leaving the simple room which he was assigned by lot along with the other cardinal-electors prior to the Conclave. 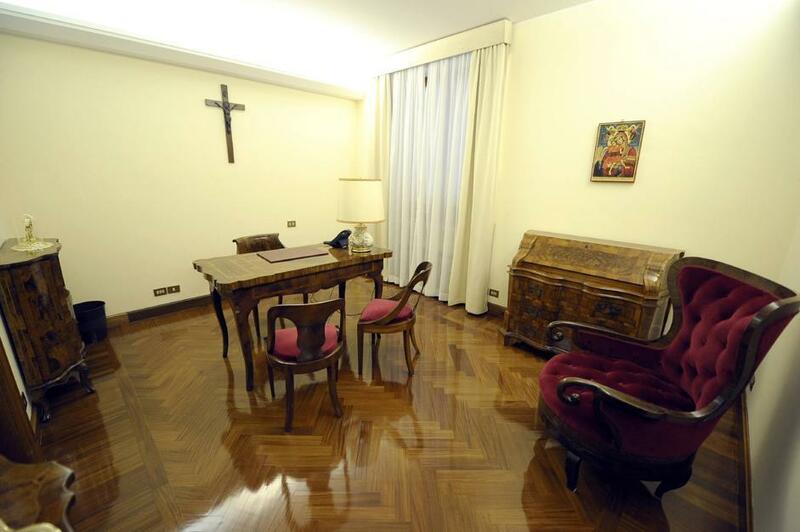 The suite had been prepared for the new Pope in anticipation of renovations others might've sought to the Palace apartment; the study in Francis' new quarters is shown above. As the pontiff determined where he'd live, the Vatican previously stated that Francis wanted his living arrangements to be marked by "simplicity and sharing." Beyond his Masses in the house chapel, the Pope is said to have been taking his meals in common with the Domus' residents and guests. As cardinal-archbishop of Buenos Aires, Jorge Bergoglio famously eschewed the house that came with the post for a simple apartment, where he did most of his own cooking and cared for an elderly cleric. Opened in 1996 near the basilica's Arch of the Bells, the Domus normally hosts prelates visiting the Vatican on church business. Its prime purpose, however, was to provide accommodation for the cardinals during a Conclave – before its construction, generations of electors slept in makeshift, barracks-like quarters splayed through the antique rooms surrounding the Sistine Chapel, the beds often separated from each other merely by curtains. Beyond seeking a humbler set-up – not to mention a home-base that's less isolating and, perhaps, easier to sneak out of as he sees fit – Francis' decision to remain at S. Marta underscores a unique reality of the new papacy: unlike his predecessors since time immemorial, the pontiff has no personal household of aides and domestics who've come with him to the Vatican. As the household traditionally shares the Palace residence with the Pope, the lack of a "family" of his own means that Francis would've been occupying the old apartment by himself.